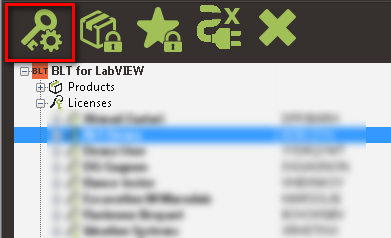 •Select the license for which you want to edit attributes and click on the Product Attributes button. (You can also right-click on your product in the tree and select Configuration >> Configure product attributes...). See here for Licenses configuration in batch. •Configure the following attributes and settings as you want. The ID is an unique identifier for the license and cannot be changed. oFull Name: Identification name for this user or group of user. oActivation Key: This is the unique activation key assigned to the license user to access your products. This is a 8 alphabetics characters key automatically generated by BLT and it cannot be changed. oEmail address: Enter the email address of the user, or user group admin. You cannot have multiple licenses with the same email address having permissions on the same product. This helps to prevent users to auto-register multiple times for a product trial license with the same email address. This also ensures that a user is always able to retrieve the right Activation Key from any of your product, using his email address. oLicense usage: If Disabled, any user of this license will be unable to use the product(s) associated. If Enabled, the user will be able to use the product(s) unless there is another limiting attribute. oLimit date: This parameter is optional. Set a date and time at which the license will be expired and the user will not be able to use it anymore unless you change this setting. (This is the local date and time of the machine where you set the parameter. The value will be then converted in UTC format and applied independently of the end-user's location and system time settings). Leave the default value (or right click on the control and select Reinitialize to default value) if you want to ignore this attribute. oAllowed usage period in days: This is the number of days, starting from the first use of the license, where the user(s) of the license will be able to use it with your product(s). Set 0 to ignore this attribute. o Number of launches allowed: This attribute needs the Sessions and Errors logging attribute enabled to work. When the license has been used to start a product more times that the number specified here, any user will be unable to use this license anymore with your product(s). oSimultaneous license uses: This attribute needs the Sessions and Errors logging attribute enabled to work. 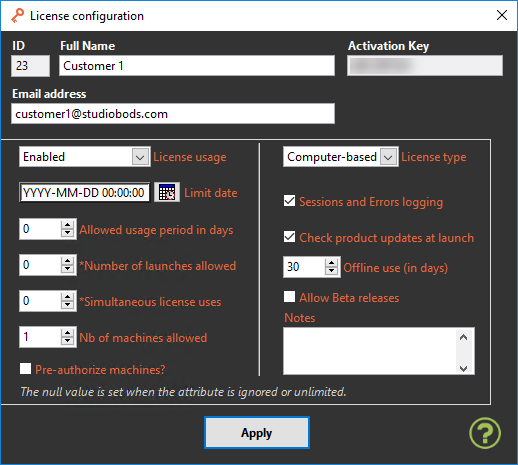 Use this attribute to limit the number of concurrent uses of the license. If the limit is reached, when a user tries to start a product with this license, he will not be able to continue unless someone else using this license stops the product.There can be a 1 minute delay between the time when a user stops to use the license and the time when another user can start the product. oNumber of machines allowed: Use this to limit the number of physical computers where this license can be used to start or activate a product. When a license have been used to activate or start a product on this number of physical machines, the user of the license is not able to activate one of his product on any other machine. Set 0 to ignore this limitation. Set 1 to make sure that the license's user will not use your products on more than 1 physical machine. o Pre-Authorize machines? : Check this box if you want to avoid end-users of this license to use a product a new physical machine, without being authorized by you before. If this box is checked, the the first time a user is trying to activate a product with this license on a new machine, he will be prompted to generate a MachineID file and send it to you via email. Then the user will not be able to finish the activation process on this machine until you authorize it manually. See here for Machine authorization. ■Computer-based: A copy of the license information is stored on the end-user's machine for each product separately. This allow the user to use the product without having connectivity to the Internet. The end-user will enter his Activation Key only one time per product and physical machine. Then, the local license will be used for activation checks and will be periodically synchronized with the Licensing Server. This copy of the license information is stored separately in the home folder of each user using a product on a machine. This ensures that you are protected against different users of a single computer trying to use your product, forcing each one of them to activate it with his license one time. ■User-based: A user-based license cannot be used concurrently with a Computer-based license on a same physical machine. This is because the User-based license forces the user to enter his Activation Key each time he starts a product. There is no copy of the license information on the computer and the connectivity to the Internet is required to activate the product. This allows you to use BLT licensing as an security system for your products, making sure that a user cannot use them without providing his Activation Key. Since there is periodic activation checks in background, the end-user's machine must stay connected to the Internet for your product to work. When a user is tries to activate a product with a User-based license, BLT makes sure that there is no existing Computer-based license already activated on his machine for any product. This ensures that a user cannot access a product illegally by using an activated Computer-based license copy already existing on the machine. o Sessions and Errors logging: Checking this box enables the Session tracking and Error logging features. When an end-user starts a product with a license configured with this attribute, BLT registers a unique session on the Licensing Server for this product usage. You can then follow how your products and licenses are used by getting the beginning and ending date for the session, as well as the product version used. See here for managing the sessions. When this feature is enabled, it also allows you to remotely track errors occurring in your LabVIEW source code and retrieve custom message logs. Learn more about how to Add BLT error tracking in your application and how to use the BLT API for custom remote logging with LabVIEW. This feature does not work if the end-user doesn't have connectivity to the Internet. You can then manage your errors et custom messages directly from the home tree. oCheck product updates at launch: If an end-user is using a license with this feature enabled, the program will request the Licensing Server for available product updates. This also enables the periodic product update checking executed in background of your application. oOffline use: This is the number of days allowed for the license's end-user to use a product without having synchronized the license state with the Licensing Server. This setting applies only to Computer-based licenses since User-based licenses cannot be used offline. This attribute allows you to ensure that an end-user will not be able to "disconnect" a product from the Licensing Server and keep using it with obsolete license attributes. The minimum value is 1 day. Set 0 to ignore this attribute and do not limit Offline use. oAllow Beta releases: Check this box in order to allow this License to see and install Beta Releases. See here how to Distribute a Product update as a Beta release. oNotes: This field is a free text field that only you can see. Your end-user will not be able to see the value of this field when they access their license information.